Mugsy's Rap Sheet » Peace At the Barrel of a Gun. 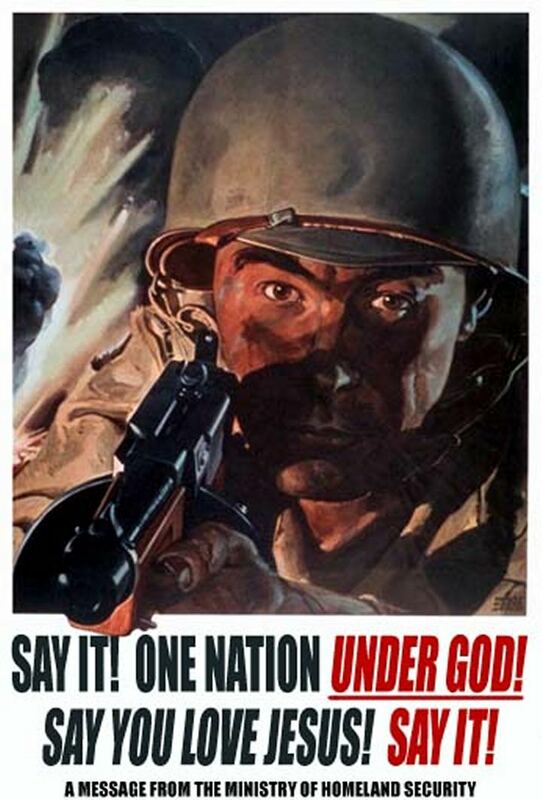 Is Threatening to Nuke Our Enemies the Way to Encourage Peace Talks? In the movie “All the Presidents Men”, WaPo Editor Ben Bradley tells Woodward & Bernstein about Chuck Colson (special counsel to President Nixon): “There’s a cartoon on his wall. The caption reads, ‘When you’ve got ’em by the balls, their hearts and minds will follow. '” That scene has always stuck in my mind as perfectly describing to me the Republican philosophy towards working with others. “I don’t care if you like me just so long as you bend to my will.” The complete lack of respect for anyone who doesn’t think like they think; want what they want. And they will achieve those ends by any means possible. Damn the consequences (see: “deposing Saddam.”) Bully your opponents until they bend to your will. It’s the story of the fastest gun in the West who must live with his back against the wall in constant fear that one day, someone is going to test just how good a shot they really are. It’s the proverbial “gilded cage”… which is just fine I suppose if you’re a xenoaphobic isolationist like most Republicans who live in constant terror of the outside world “invading” theirs. This philosophy suits Trump to a T. Like any Toddler, Trump doesn’t behave like a rational adult. He throws a tantrum until he gets what he wants. And in the case of North Korea, he threatened “fire & fury, the likes of which have never been seen”… should they threaten the United States with a missile test. And “suddenly”, Kim Jong Un is talking to South Korea about “denuclearization”… even signing a “pledge” to do it… someday (details yet to be hammered out following the Summit with Trump.) Trump bragged in Michigan, “They [the Media] are asking ‘What… if anything… did Trump have to do with it? Uh… EVERYTHING! (insert obnoxious bouncing smirk here. )” And for this, some Republicans are already talking about “a Nobel Peace Prize for Trump” if he successfully denuclearizes North Korea. Shortly after Bush-43 took office, Dubya’s inclusion of NK in his “Axis of Evil” speech (before invading Iraq) pushed them into starting a nuclear weapons program, even testing their first ever nuclear weapon in 2006 (during the Bush Administration.) The result was to bring BUSH to the negotiating table (though to Bush’s credit, they DID convince NK to dismantle their lone nuclear facility. And they didn’t have to resort to threatening a nuclear strike.) NK’s missile testing slowed (but never stopped) during Obama’s eight years, and when Trump started saber-rattling his first months in office, NK’s nuclear weapons development switched into hyperdrive, producing an ICBM in record time capable of reaching the U.S.… all thanks to Trump ramping up the rhetoric against North Korea. And now, suddenly, North Korea is meeting with South Korea, “pledging” denuclearization, and agreeing to face-to-face talks with Trump. Why? Trump’s threats? No. 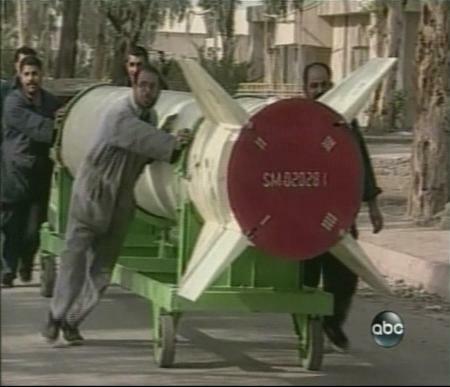 You think North Korea & Iran don’t remember Bush invading Iraq AFTER they agreed to dismantle their al Samoud missiles and allow in inspectors to confirm they’ve been disarmed? Belligerence may get you what you want… THIS time. But eventually, the empty threats will get old. The neighborhood kids will stop playing with you, and one day, some kid who is tired of being bullied is going to call your bluff and/or shoot you dead on the playground with a homemade weapon he’s been constructing in Daddy’s basement for the past 18 months plotting revenge. Trump is also threatening to tear up the Iran nuclear deal. As much as Trump man-crushed on French President Macron during his visit here, Macron (along with every other European leader) is begging Trump NOT to blow up the Iran deal (pardon the metaphor.) If Trump reneges on the Iran Nuclear Deal brokered by Obama (another “If the black guy did it, it must be bad” spurious reversal), what nation would EVER agree to ANY deal with the United States ever again if there was a possibility that in 4-to-8 years, the next president will simply rip it up, declare it “null & void”, and demand more from them? That makes us LESS safe, not more. And Republicans want Trump to win the Nobel Peace Prize… WHILE he’s threatening to further destabilize the entire Middle-East. I believe I mentioned previously, it wasn’t Trump’s belligerence (in his August 2017 “Fire & Fury” speech) that suddenly finally brought North Korea to the bargaining table in 2018. It was the Summer Olympics in South Korea. Kim Jong Un had never set foot in South Korea before last week. When the Olympics came to Seoul, South Korea called the North and proposed their athletes compete as one team. Kim sent his sister to the Olympics instead of going himself, then watched the ceremonies on TV. The technical glitz & glamour, and the comfortable modern lives of those living in South Korea in stark contrast to the impoverished, near Dark Ages lives of people starving in North Korea. And suddenly discovering the rest of the world he has refused to visit doesn’t all live in the same daily misery North Korea does. Kim’s sister returned home, likely regaling her brother with stories of brightly lit neon skyscrapers, restaurants serving every kind of cuisine you could imagine, and shopping to her hearts content bringing home modern conveniences one could only dream of in the North. And THAT dear reader is what got North & South Korea talking. NOT Trump’s saber-rattling. That is quite literally the Mission of the Olympics… to bring enemies together, to share cultures and make friends. And it worked. Meanwhile, Trump is already prepping us for failure. AFTER he announced his desire to sit down and talk to North Korea about denuclearization (after HE himself instigated a rocket-propelled arms race), Trump fired his chief ambassador… Secretary of State Tillerson… and replaced him with the head of the freaking CIA… and not just ANY CIA chief, but a hard right Conservative like Pompeo who is CURRENTLY advocating we tear up the Iran deal (you think our agreement with Iran doesn’t loom large in Kim’s mind as he plans to negotiate with Trump?) THEN, to make matters worse, Trump appoints one of the most dangerous men on the planet, insane “mustache of truth” John Bolton, to be his “National Security Advisor”… an Iraq War hawk who once joked on Fox that the way you can tell a North Korean official is lying is “their lips are moving”, has nothing but contempt for diplomacy and famously said the ONLY thing that should matter to the UN was what is in America’s best interest. 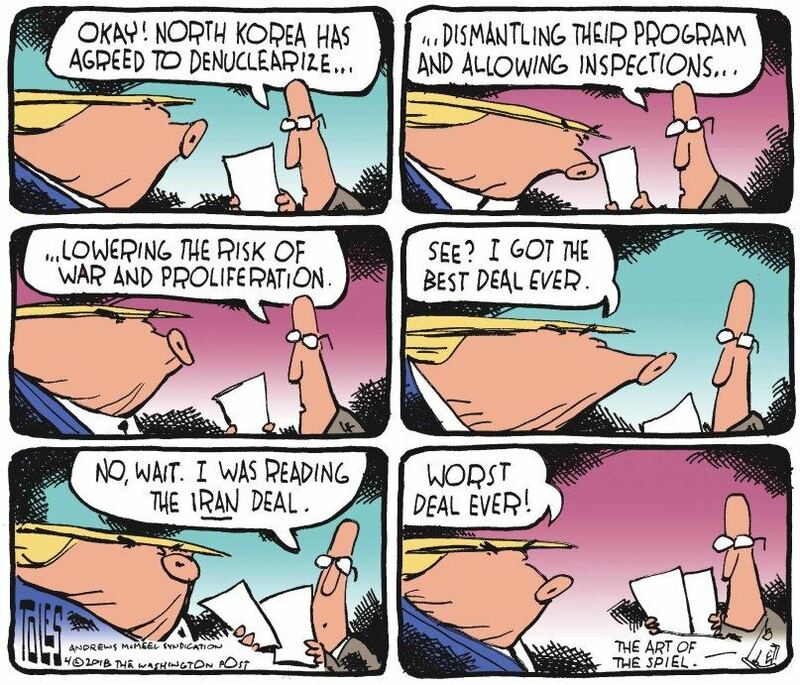 So Trump appoints Pompeo & Bolton to his staff in key roles that will influence negotiations, announces his list of demands of North Korea before negotiations even begin (including NK agreeing to “complete & total denuclearization”), and then start preparing the public for his possible (read: inevitable) walk-out on negotiations should he decide they aren’t proceeding as he likes. And then what? Threaten to bomb them again? Peace at the point of a gun. Would that be before or after they award Trump his Nobel Peace Prize? Writers Wanted Got something to say? Mugsy’s Rap Sheet is always looking for article submissions to focus on the stories we may miss each week. To volunteer your own Op/Ed for inclusion here, send us an email with an example of your writing skills & choice of topic, and maybe we’ll put you online! Please REGISTER to be notified by e-mail every time this Blog is updated! Firefox/IE users can use RSS for a browser link that lists the latest posts! I was just reminded that we also convinced Libya to give up its nuclear program, only to later have the U.S. assist the Libyan rebels overthrow & kill him.